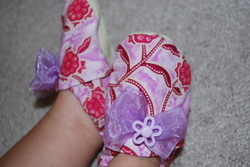 Karoline received a package in the mail yesterday--her first pair of shoes with soles! Her feet were very happy and she sends along a smiling "thank you" to Mrs. Quigley. Now, I really look forward to Michele's promised tutorial!